Our mistake, in retrospect, is as glaring as the ballast in a thousand-watt grow light: We figured you all had inhaled enough Humboldt hints -- the fertilizer ads promising "enormous buds," the billboards touting "higher yields," heck, the print ads in our own pages -- that you'd cotton to the irony in those quotation marks. "Garden supply." Such are the effects of living in a region where the No. 1 industry dare not speak its own name. Innumerable local businesses got their, shall we say, seed money from our illicit botanical bounty, and over the years a host of support industries have -- cough -- cropped up. And I'm not just talking about the head shops and dispensaries. I mean the doctors dealing 215 cards; the lawyers getting paid in cash; the restaurant serving gouda-bacon French fries at midnight -- and, of course, the dozen or so Costco-style hydroponics shops, which offer enough nutrients, chemicals and climate-control devices to turn your apartment into the Congo River Basin. Plenty of you did select from among these pot accessory emporiums. Others purposefully shined on our punctuation inference, including one voter who threw the quote marks back in our faces, writing, "Screw this category ... I'm proud of not being a ‘grower.'" Fair enough. Ultimately, our smugly ironic quote marks were smashed to smithereens by the Big Hammer. Pierson's, the palatial 50-year-old building supply center on Eureka's southern runway, defeated the dozen-or-so stoner upstarts. How, you ask? Maybe it was naiveté. Maybe it was backlash against the marijuana industry's dark side -- the home invasions, the environmental damage, the obnoxious profiteers, the murders. More likely the votes reflect genuine appreciation for the place itself. 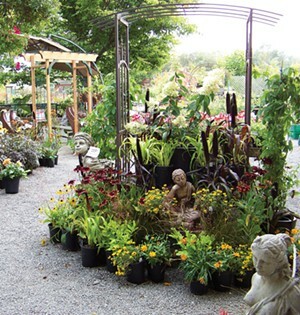 If you've never been inside Pierson's garden shop and nursery, you're missing out on a Narnia-caliber wonderland of concrete statuary, lily pad-laden koi ponds, arcing redwood arbors and -- breathe deep -- a bounty of riotous, blooming, 100 percent legal plant life. Dig it. The Breakdown: Pierson’s 21.8%, Miller Farms 13.6%, Ace Hardware 13.1%, Northcoast Horticulture Supply 10.2%, Mad River Gardens 9.5%. Category popularity: 25th.